Matt Vankirk’s team pulled an all nighter preparing for Round 1. Late at night I was getting Snaps blowing up my phone, by the time I woke up at 8am I checked my phone and found that Loren Kinsley updated everyone stating the motor was up and running. I later found out Vankirk was falling asleep in his racing seat while everyone on the crew was trying to get Snaps of him dozing off. Practice plagued the crew with drive train issues, when I walked through the pits their lead mechanic was furiously bleeding the clutch lines and contemplating on whether or not to drop the transmission and swap in a new clutch before qualifications. 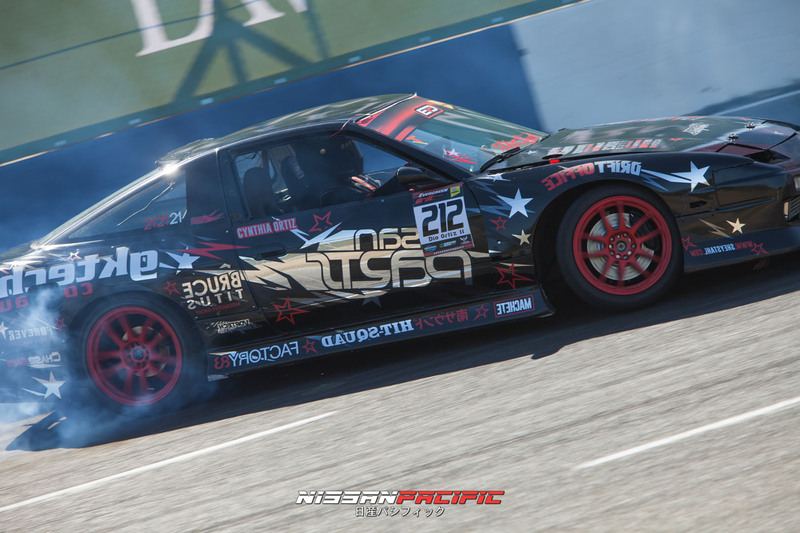 I spoke with Matt Vankirk afterwards about the drive train issues, his car wasn’t at 100%. 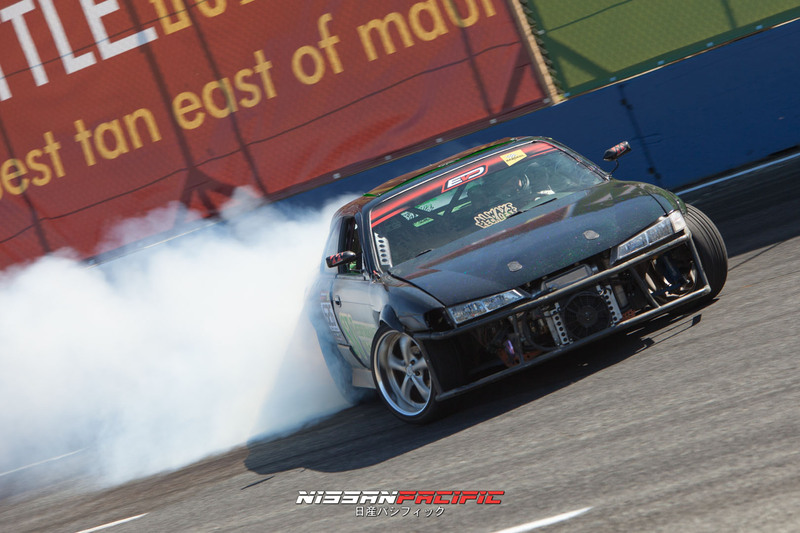 Matt couldn’t shift gears during the entire event and had to bang limiter in 3rd gear! 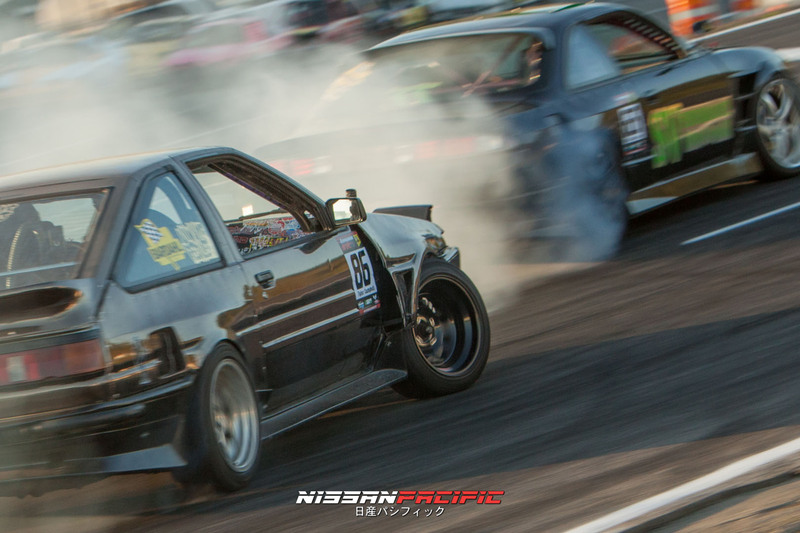 Could you imagine having to start in 3rd gear and stay in 3rd the entire way? 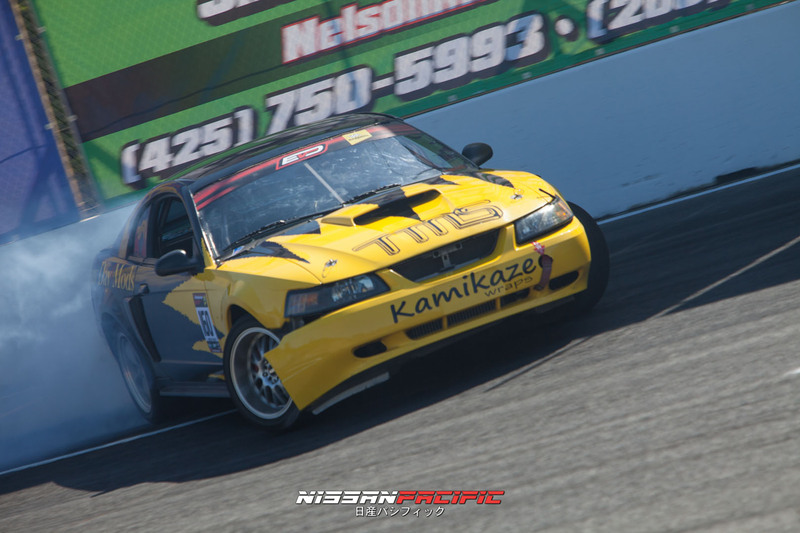 Thankfully he qualified to move on, no matter how difficult the path is, Matt Vankirk will fight to earn the ProAm points! 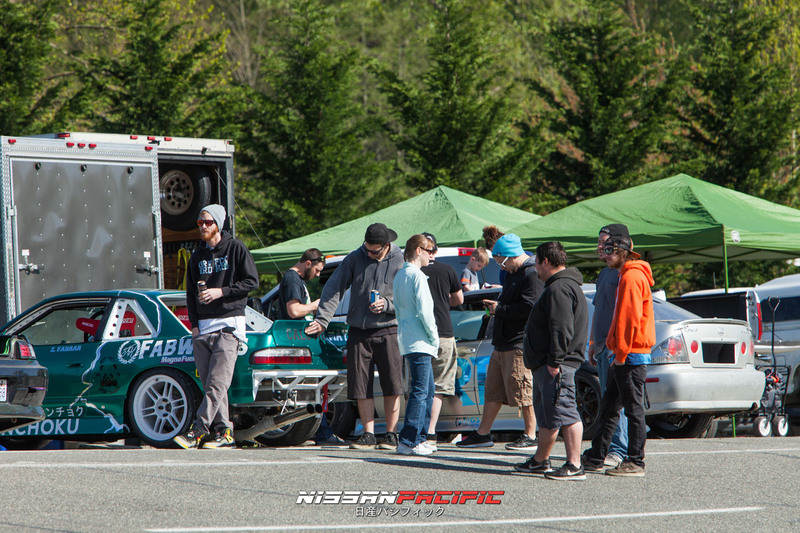 Out on the grid, Zach Farrar premiered his new livery, Aaron Macomber out of Marysville WA posted April 7th about receiving a shipment of vinyl. 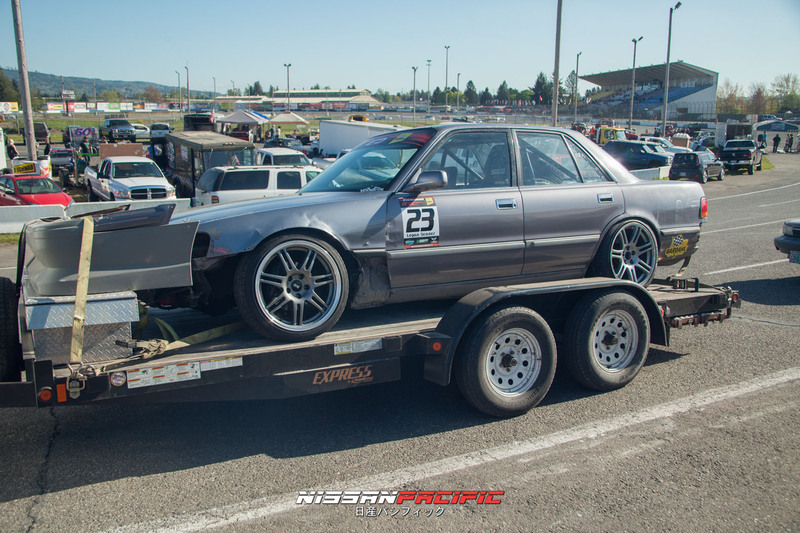 Farrar’s car went under the knife. During practice, Farrar was taking a very low line on the 5/8ths. He was working on adjusting his initiation point and line throughout the morning, eventually becoming fairly consistent on the 5/8ths. 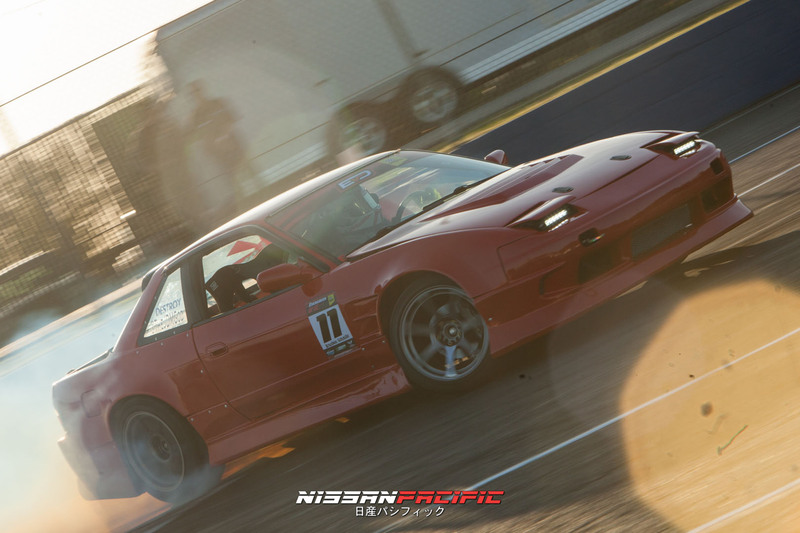 Last week, he practiced the 5/8ths in the rain during a private track day. 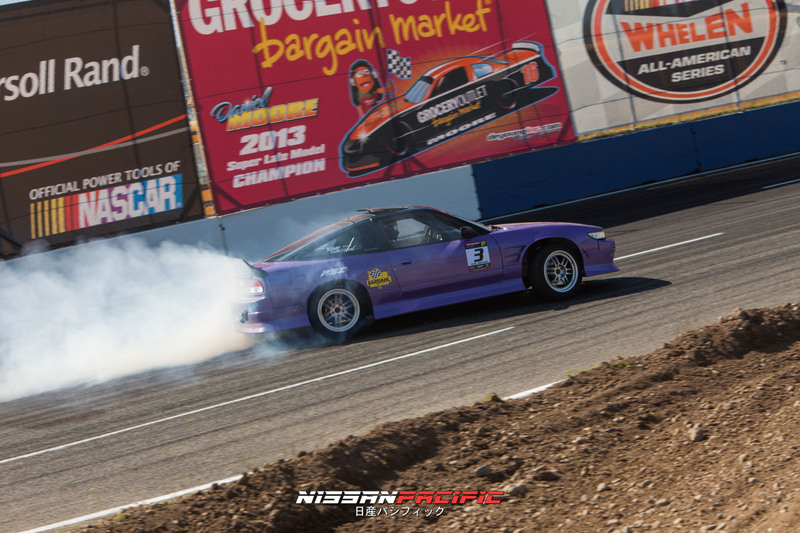 Towards the end of practice and into qualifications, I could hear Zach’s JZ lugging though the bank. 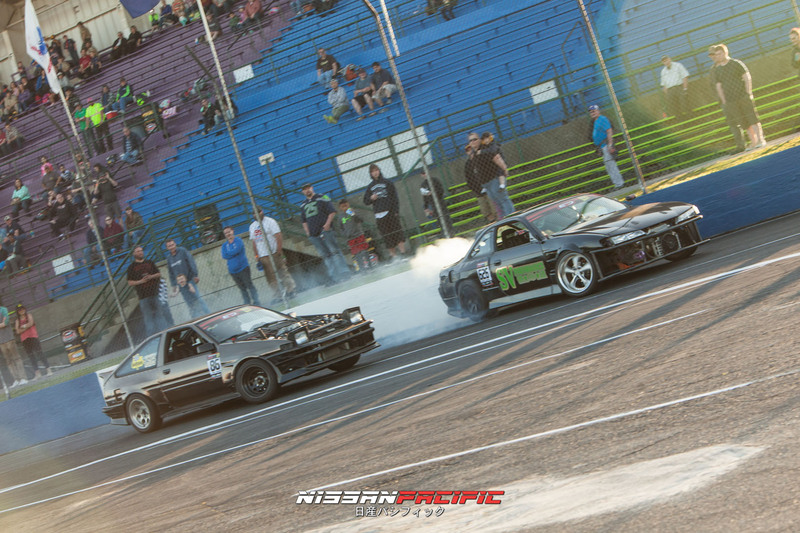 His motor was misfiring, the JZ sounded like it was running on 4-5 cylinders. Farrar wasn’t able to place during his qualification runs, the gremlins cropped up to quick! Word through the grape vine, his motor was having coilpack / ignition issues. With 4 events coming up in May, Farrar has the opportunity to iron out any mechanical issues and get in seat time. I hope to see him come back strong for Round 2! His first legit 5/8ths in the dry competition, Logan Senner came out swinging. 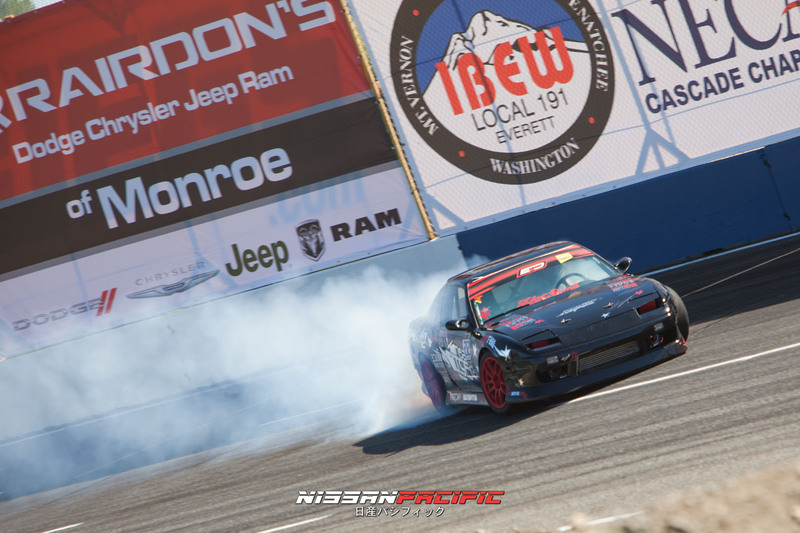 Hailing from Lake Oswego, Oregon, Logan brought his Nissan Toyota hybrid out for Round 1. 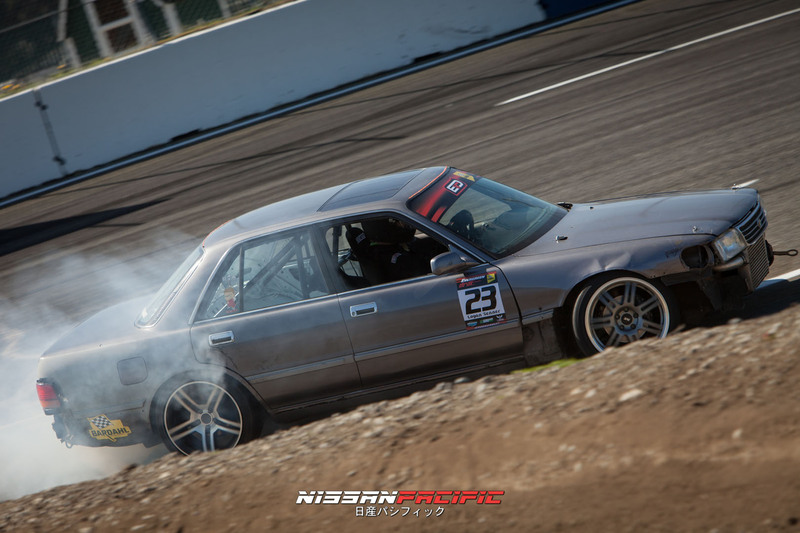 I was chatting with him on Twitter last week, apparently he’s got a Z32 transmission and Z32 brakes on his Cressida! Logan was doing great throughout the morning up until he went off the bank, it seemed like his initiation point wasn’t correct and put him on a low line. 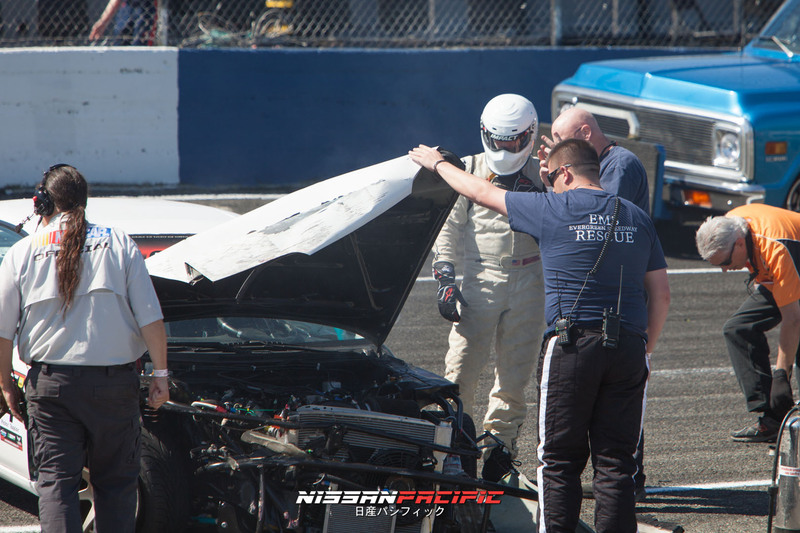 The photo above may have been the moment when he broke a ball joint, he mentioned the king pin and his steering wheel snapped. 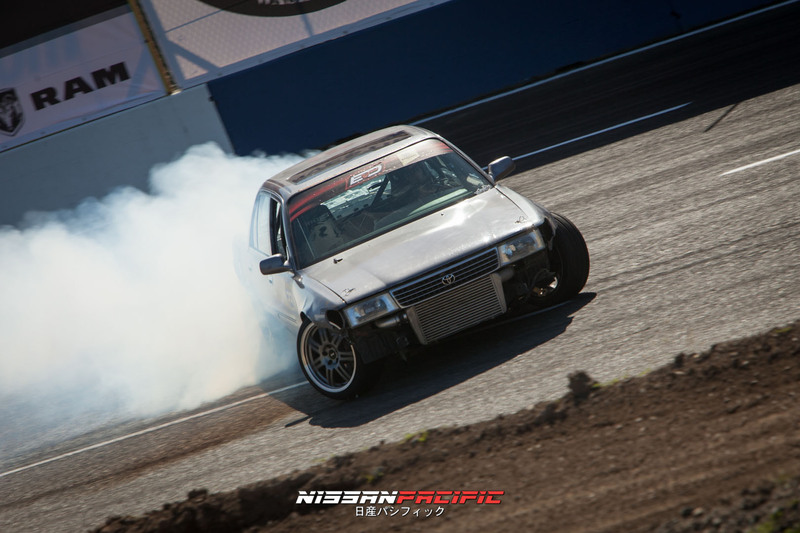 Dirt dropping on the 5/8ths isn’t like Initial D! He may have bottomed out the LCA right at this moment. Good luck in the next round Logan! 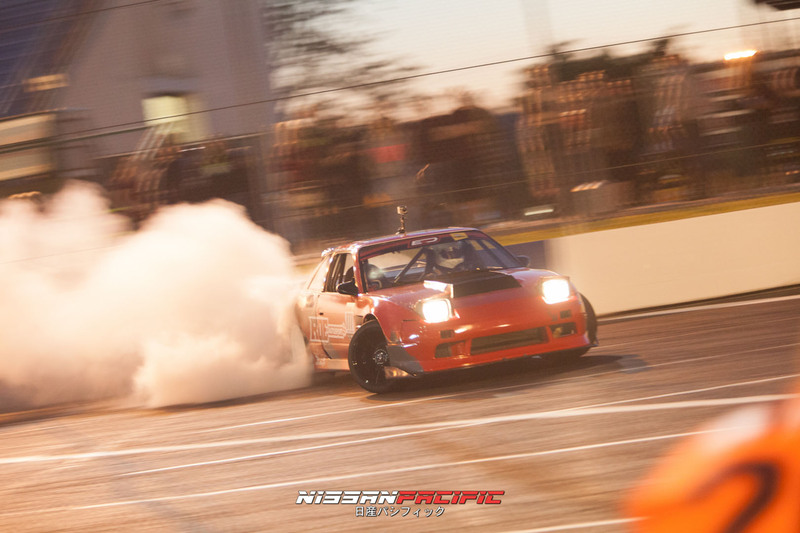 Brad Davis was able to lay down the rubber with smoke trailing through most of the 5/8ths bank. From the ground it was hard to see his initiation points, but his lines were mid to low throughout practice. 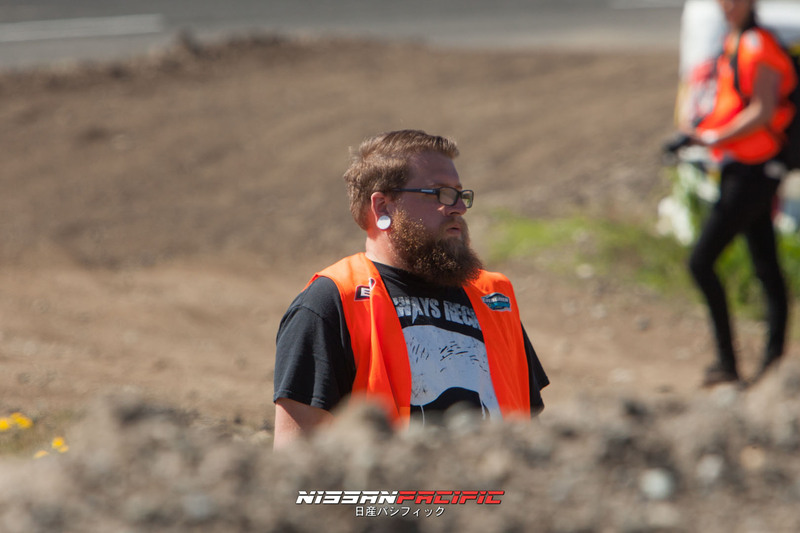 I spoke with him briefly yesterday at Jeanneret Racing, it seemed like they were working on hesitation issues he was experiencing throughout the last 2 events. 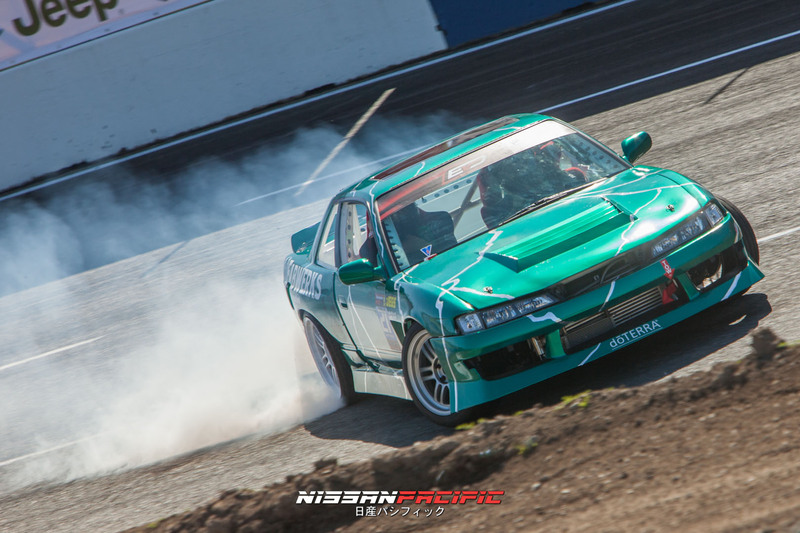 Peter Taylor debut a white S14 Zenki at round one, his first few runs were hot laps, finally stepping on the throttle for the photo above. This being the first time I’ve seen the car out on the 5/8ths, I’m assuming that early morning practice was mostly shakedown tests. 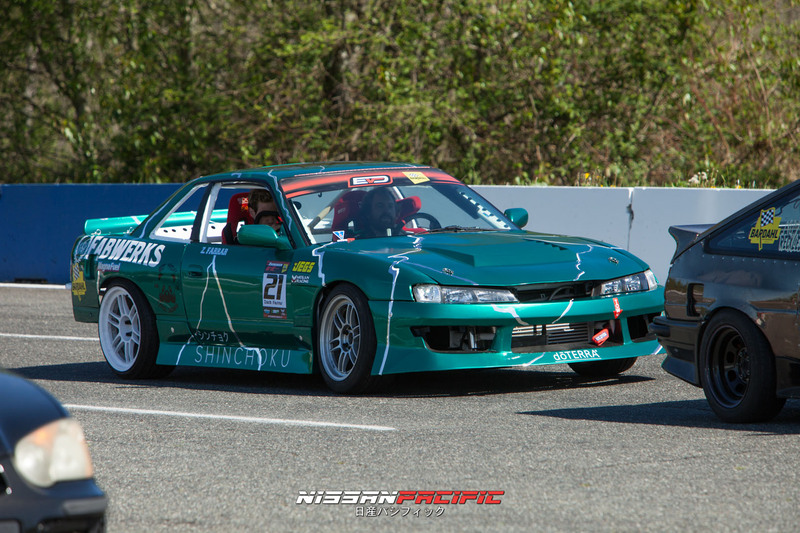 I wasn’t able to catch up to Peter to ask him about his Zenki. An unfortunate ending for Peter’s Round 1, from what I could tell it looked/sounded like he either mis-shifted or lose complete power at the wrong time on the bank. 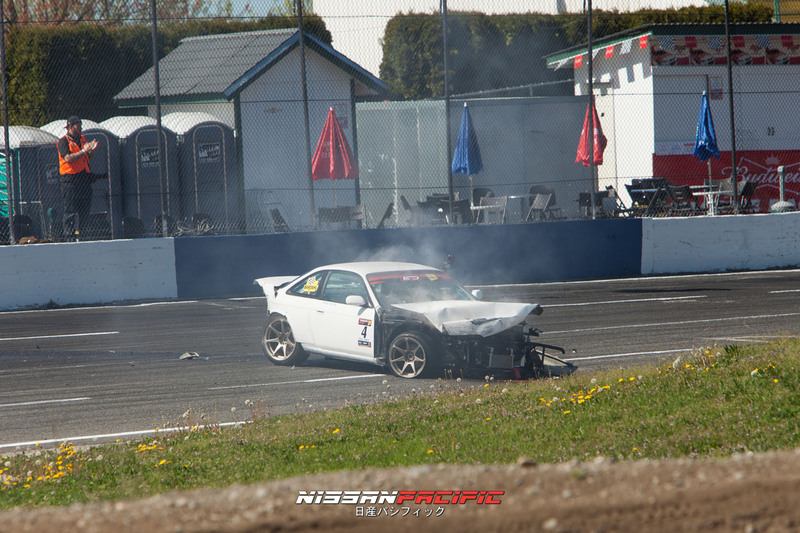 His car snapped back and nose dived into the 5/8ths wall throwing him into a spin. Thankfully he was able to walk out of this unscathed. 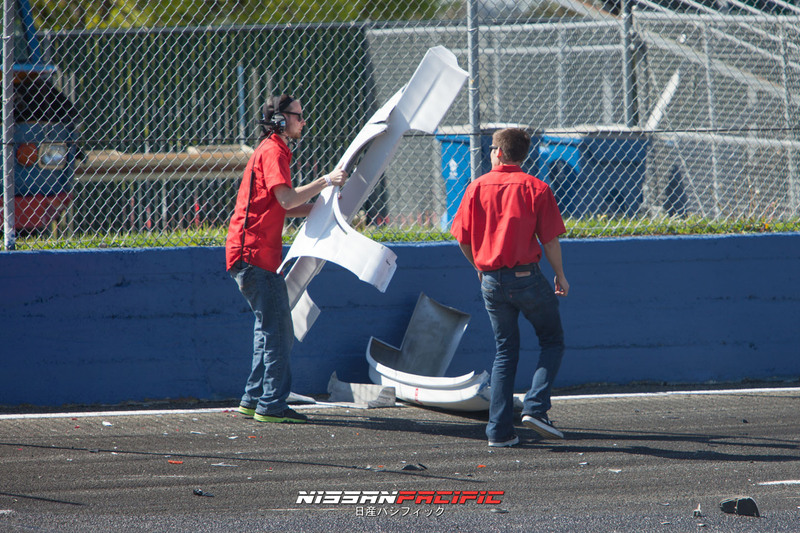 Later in the day I saw Snaps of them trying to pull the front tubing out by using a K barrier in the pits? The snap was so quick I was confused. Below: spotted a wild Justin Nigro in his natural habitat. This guy slangs beard products and cuts up vinyl like a wizard. If you ever want a high five, he’s got plenty to pass around. AlwaysReckless is growing in numbers, support your local clothing brands! On the other side of the track, Dio Ortiz II was getting prepared for his practice runs. This is how dedicated Dio is, making last second adjustments to tire pressure before hitting the grid. This really had a grassroots feel and struck close to home. 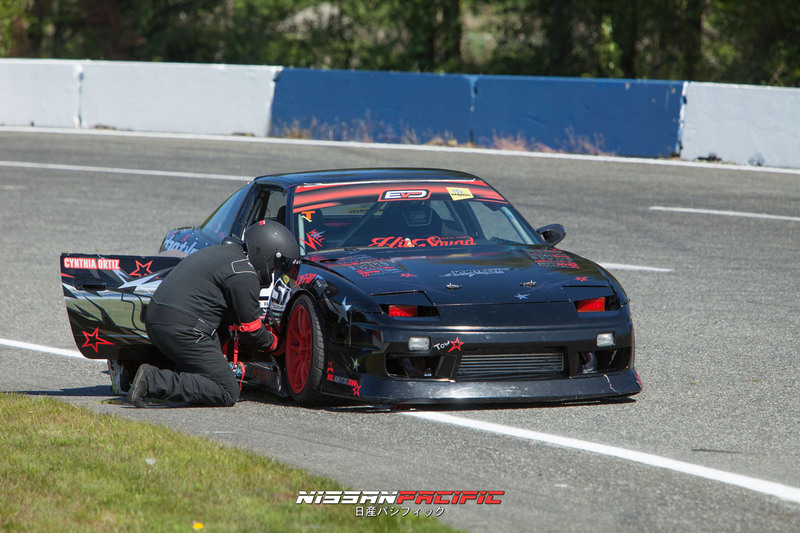 ProAm guys aren’t all glitz and glamour, some need to make things happen right then and there, I guess I’m so use to seeing pit crews buzzing around FD with tires, tools, and air compressors. Dio’s practice and qualification runs were up to par for the judges, he ended up qualifying 2nd overall to move on! 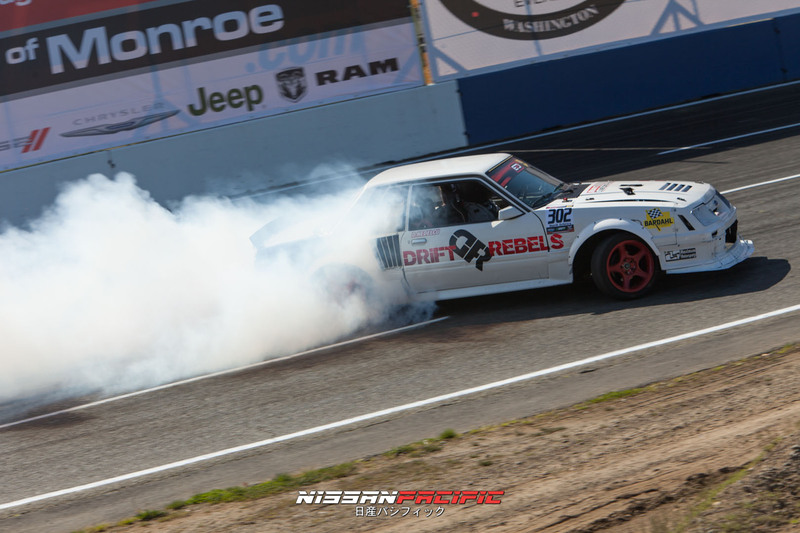 David Nedelcu of Drift Rebels was doing great during his practice runs, as far as I could tell, his 5/8ths initiations were keeping him on a mid to high line all morning. From my perspective I wasn’t able to see him exiting the bank into power alley. I followed up with David to ask how his qualification runs went, he mentioned his first qualification run he went 2 tires off and his 2nd qualification run he had a mis-shift, causing him to straighten coming off the bank. 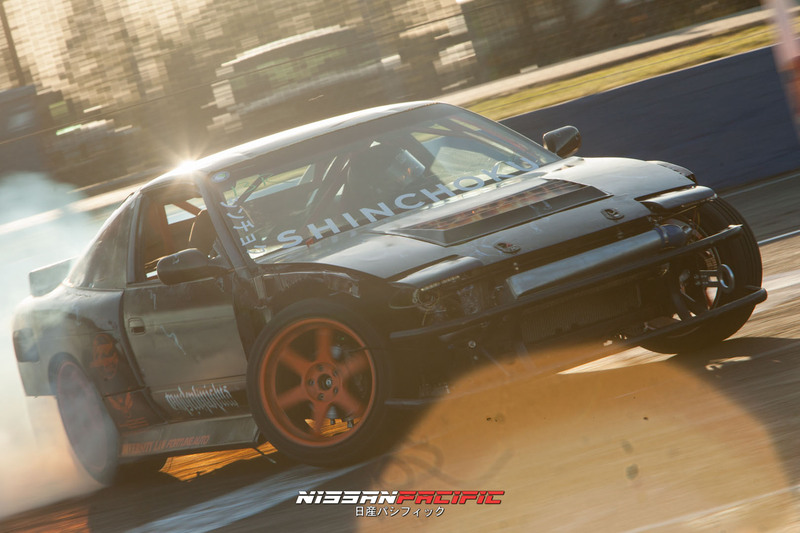 Good luck in the 2nd round in June at DriftCon! 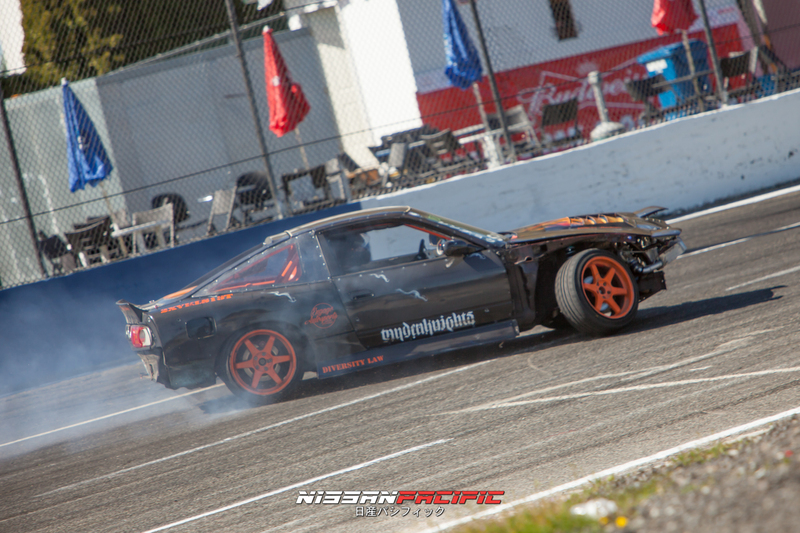 Johnathan Burns was on a crunch to get his Mustang motor running consistently, him and David Nedelcu wrapped up a few issues the night before in time for Round 1! Johnathan made it out for 5/8ths practice, but later in the morning his power steering pump went out. In between practice and qualifications, there was a lull as the NASCAR drivers pitted in. 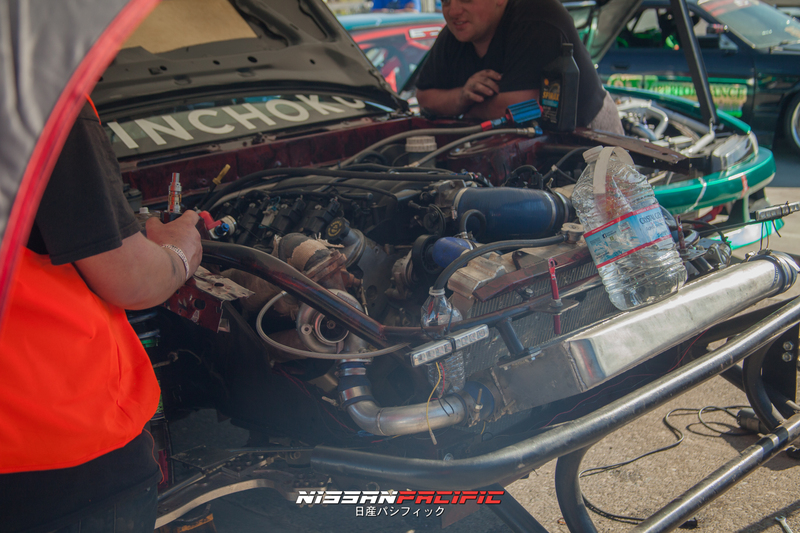 Johnathan scrambled to find a power steering pump, but unfortunately couldn’t replace it in time for qualifications. 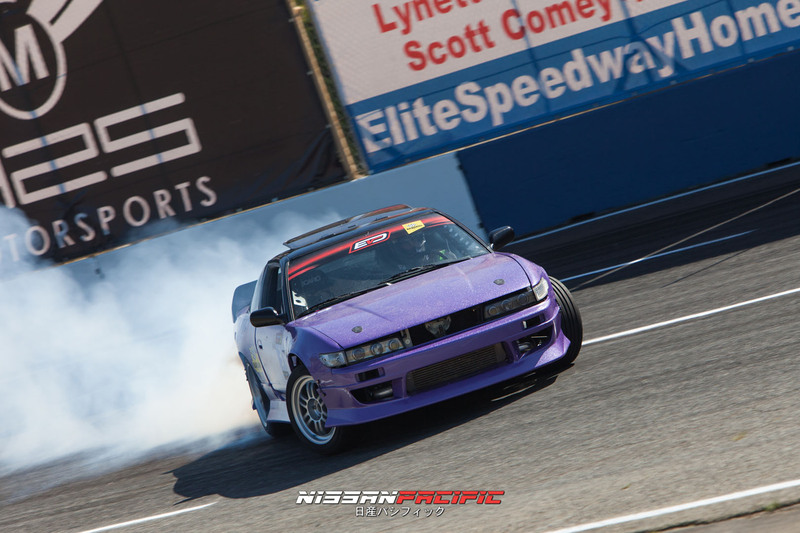 Arie Abrams sliding the 5/8ths in in SR20DET powered sileighty, he made the top 8 qualifications and was matched up against Brandon Schmidt. ProAm Top 8 was boiled down to the top contenders, all the consistent drivers managed to dominate the 5/8ths and power on to the finish. Qualifiers that made Top 8 is as follows. At this point of the day, media and drivers had a huge gap between qualifications and opening ceremonies. There was suppose to be practice before the NASCAR events kicked off but I’m not 100% why that didn’t happen. 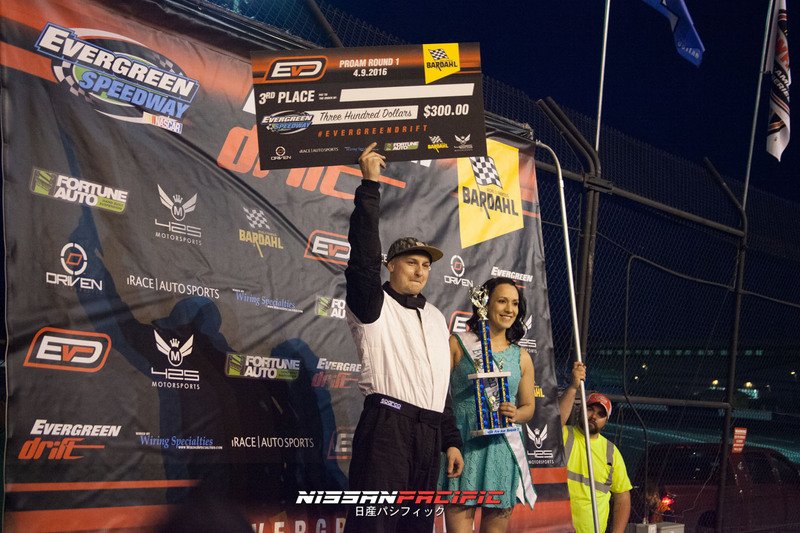 Bare in mind that ProAm was also running as a division for the NASCAR Nights events held by Evergreen Speedway. 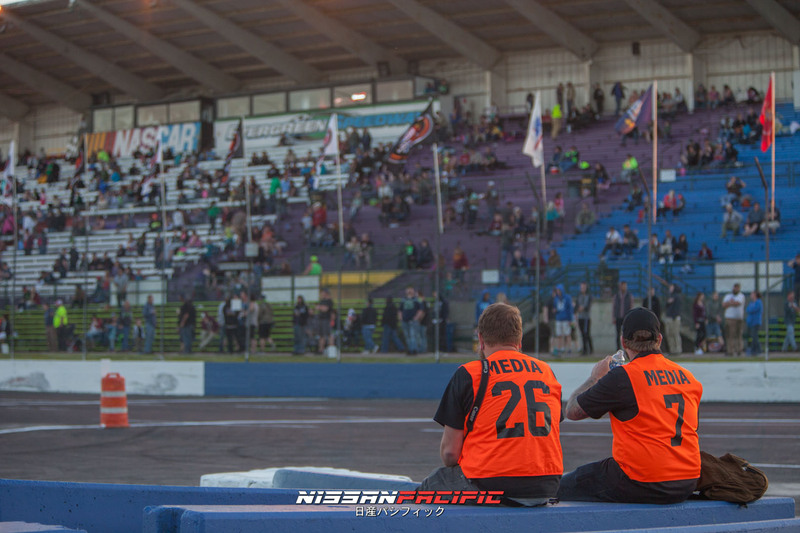 By the time 5pm rolled around, drivers, media, and spectators were out on the track for the 5pm Fan Fest! I was speaking with Arie Abrams earlier today and I found out that he got knocked out of the Top 8 chasing down Brandon Schmidt, he mentioned, “I blew 3rd trying to chase Brandon on the first run against him.” I wasn’t able to get any photos of them in tandem, I hope to see Arie make a come back in Round 2. Good luck! Tyler Grimsley went up against Vancouver WA native, Travis Reeder. 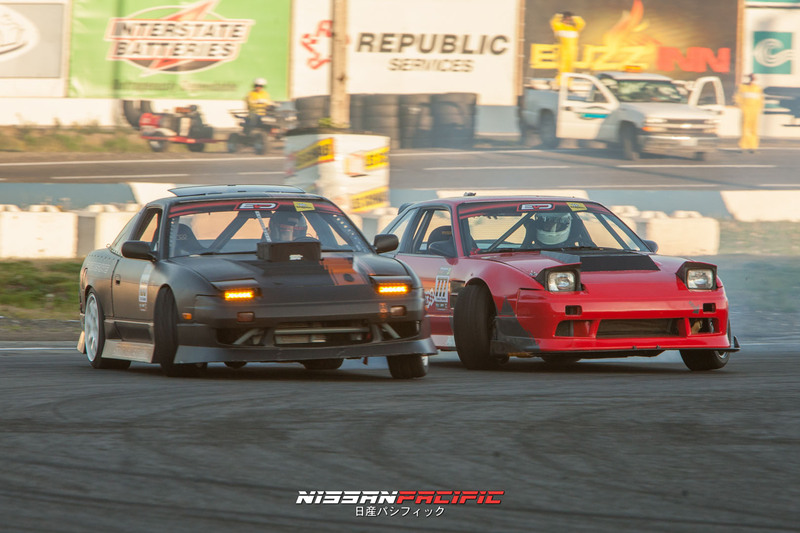 The gloves were off as these two V8 titans battled it out. Reeder managed to keep a close proximity with Grimsley. 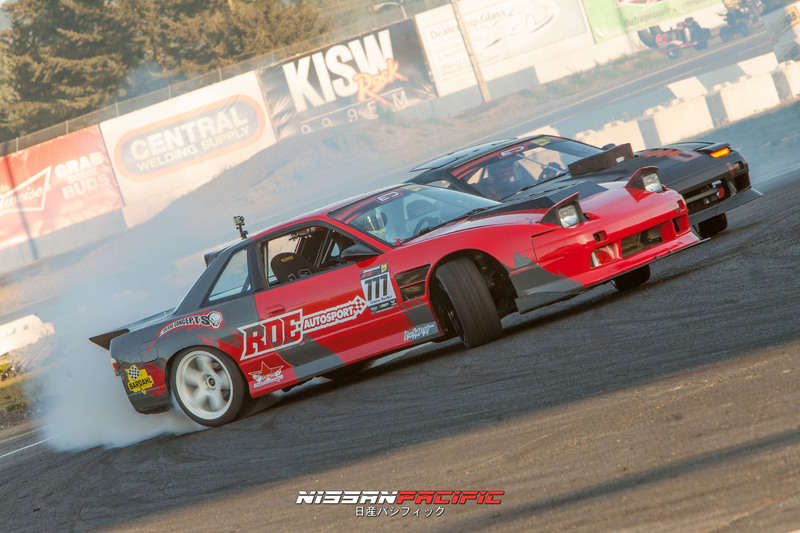 Ultimately, Travis Reeder in the red S13 coupe advanced on towards the Top 4. 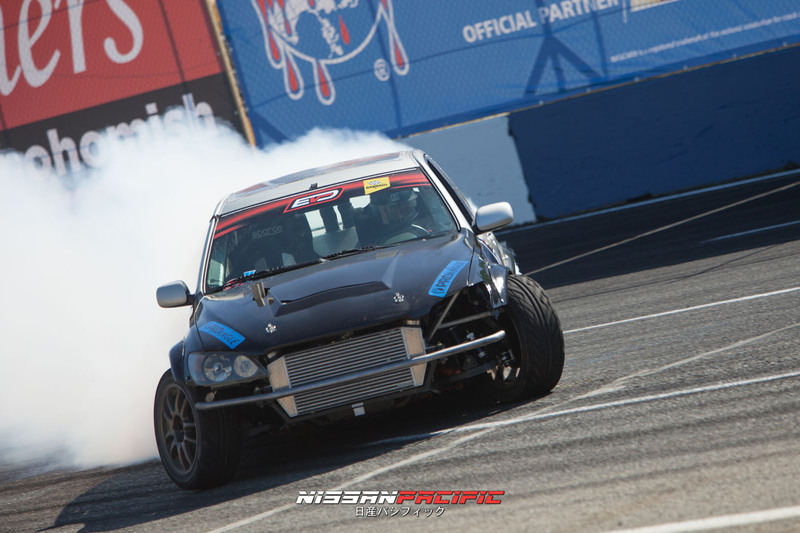 Team AlwaysReckless, Nate Snyder and Tyler Campbell were pitted to duke it out early in the Top 8 bracket. Tyler was able to put up a good fight through qualifications and to match up with Snyder. His disadvantage? A slipping clutch, which didn’t stop him from staying on Snyders tail! 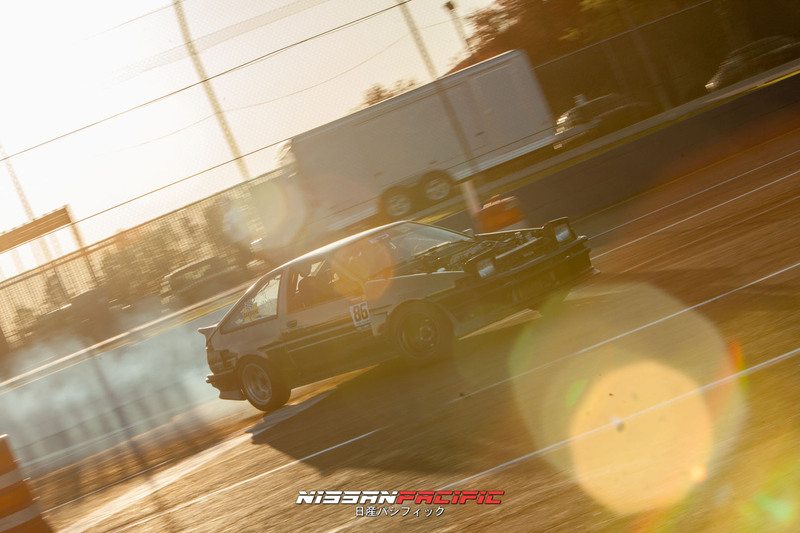 Knocked out early before dusk, Dio Ortiz II was matched up against Matt Vankirk, as you may recall we mentioned that Vankirk made it this far with 1 gear, 3rd gear only! 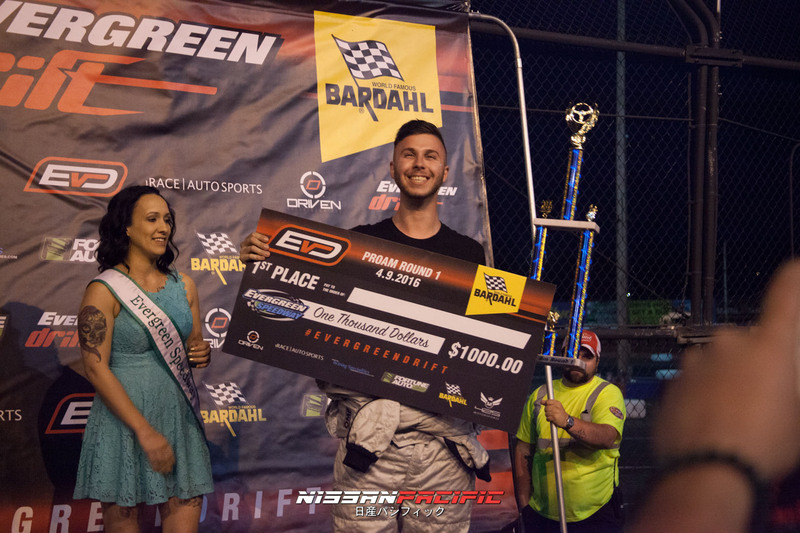 Without the ability to shift out of 3rd, Vankirk put on a show. Dio mentioned on Facebook that coming off the bank his 3rd gear slipped out while in power alley, causing him to straighten. A major upset for Dio fans, luck was swinging towards Vankirk all day. Matt Vankirk later matched up against the top qualifier Brandon Schmidt. These battles were a close call, but Schmidt ultimately pulled ahead. Matt Vankirk was knocked out by Schmidt, which put Vankirk up for the battle for 3rd place against Tyler Campbell. Above, Campbell taking a solo run for 3rd place. 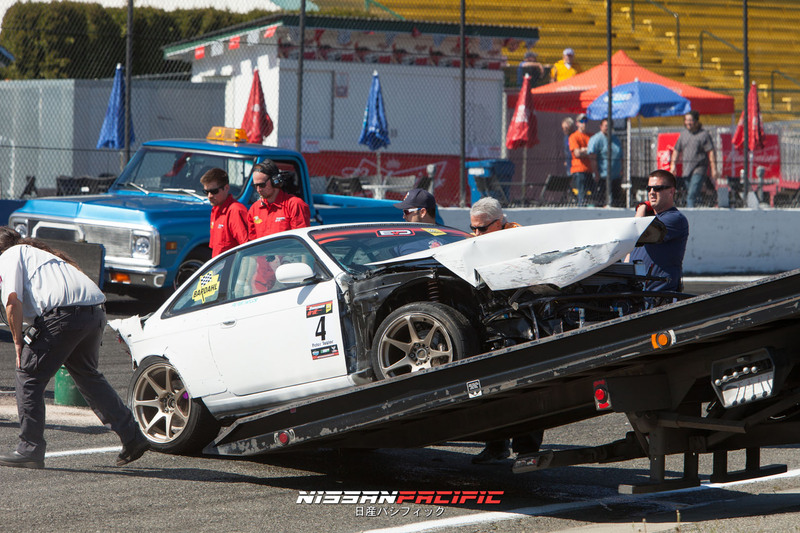 As far as I heard, Matt Vankirk had mechanical issues when he went up against Tyler Campbell. Vankirk was down on power as Campbell took the win for 3rd. 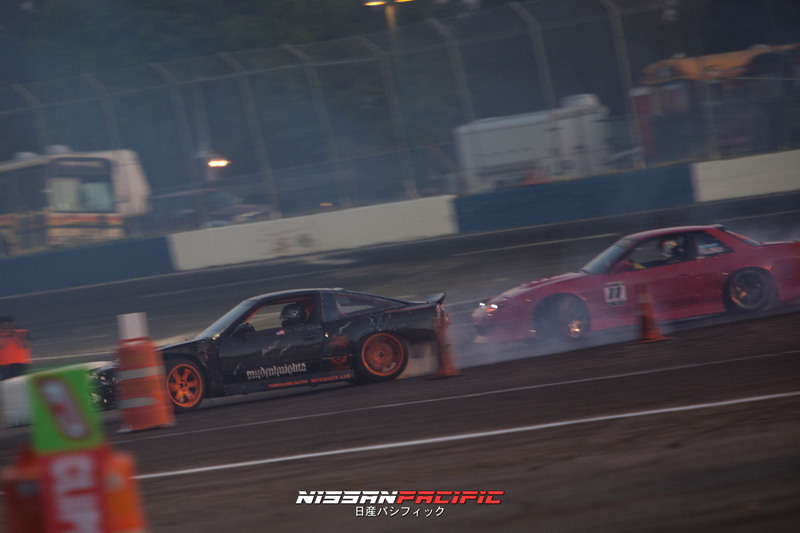 Travis Reeder vs Brandon Schmidt, two of the top contenders were out on the grid. 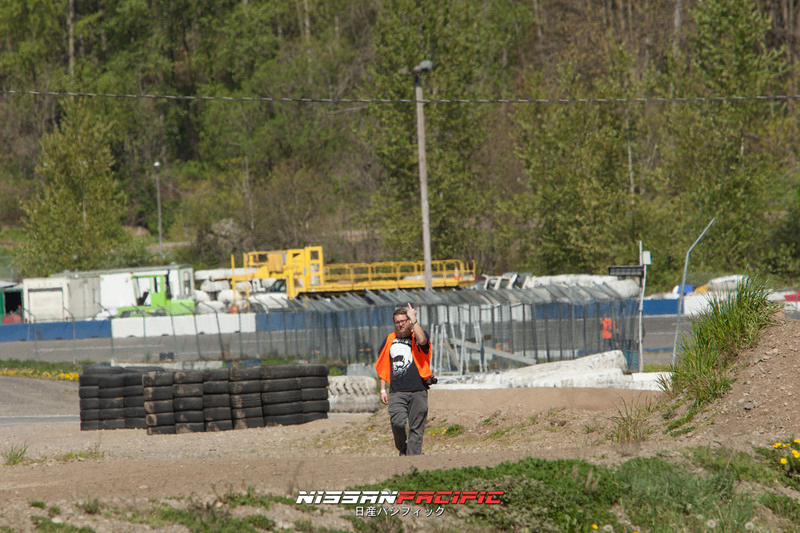 Evergreen Speedway’s flood lights weren’t turned on. Unfortunately my inexperience with low light I wasn’t able to get quality photos during this battle. Both contenders were neck and neck to the final tandem, Brandon Schmidt placing 1st! 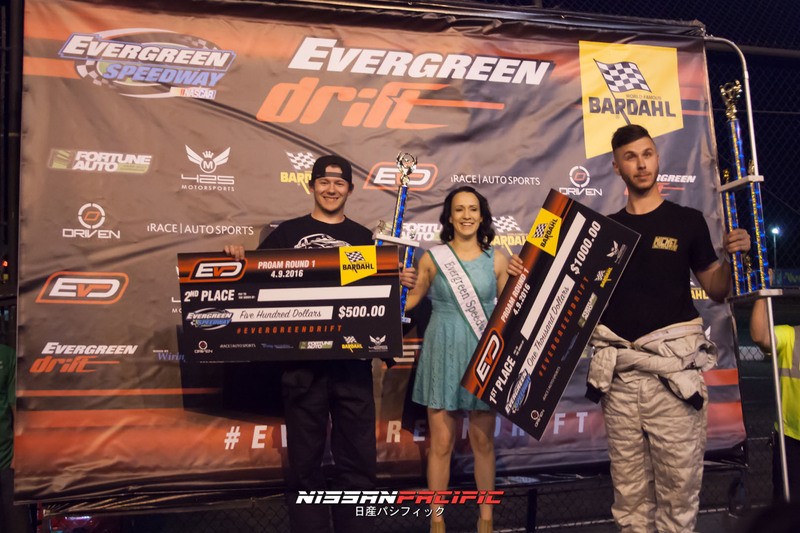 Congratulations to Tyler Campbell, Travis Reeder, and Brandon Schmidt for placing top 3 in EvergreenDrift’s ProAm Round 1! 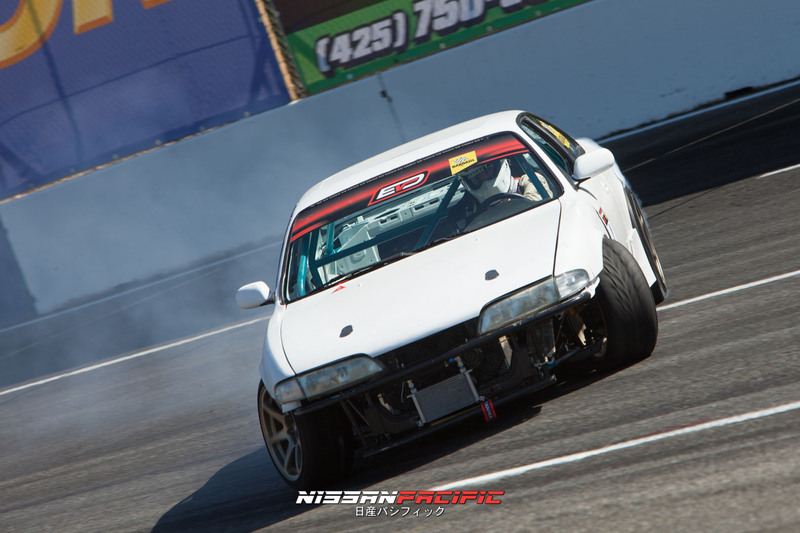 We hope to see all the drivers and more show up for Round 2 at DriftCon June 4th! 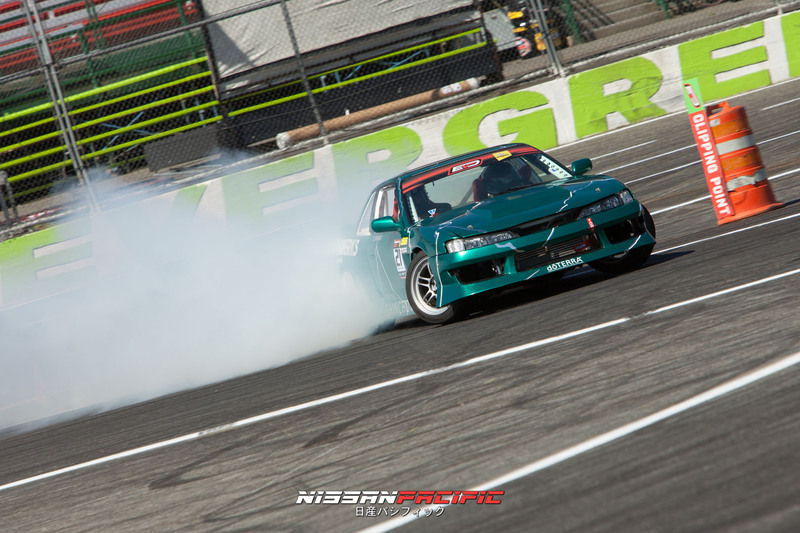 Below is a full gallery of photos taken at #FDProAm Round 1 @ Evergreen Speedway. If you are a driver or fan, please feel free to save and share these out to social media. 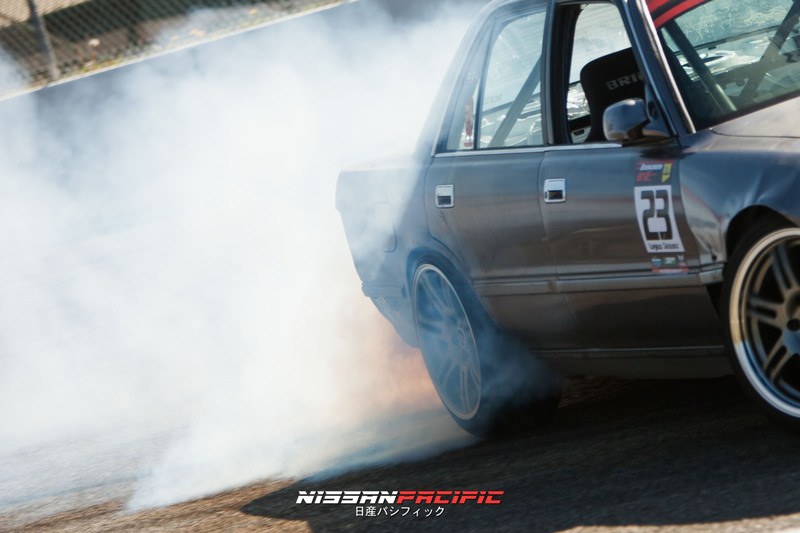 I only ask that you tag NissanPacific or use hastag #NissanPacific to help build the online community. 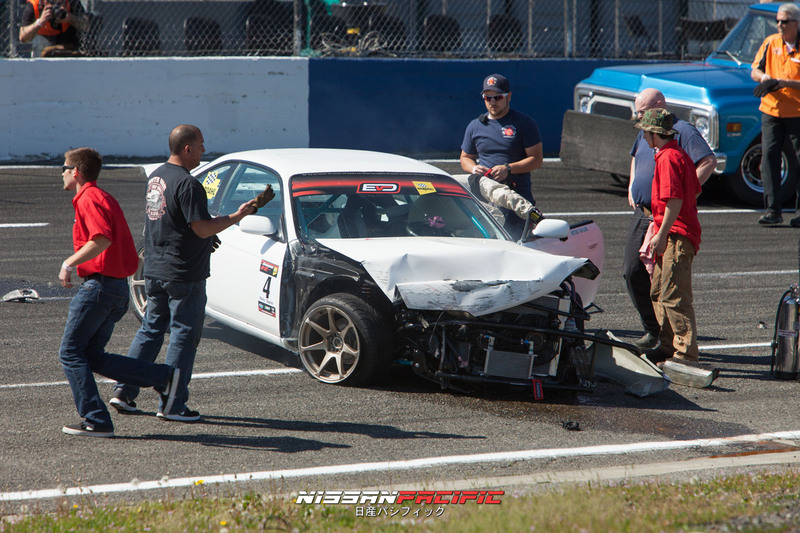 Show your support by rocking a NissanPacific decal, or just buy me a beer next time we’re all out at the track! I have had a few drivers and media outlets buy a few photos, don’t be shy if you want prints. 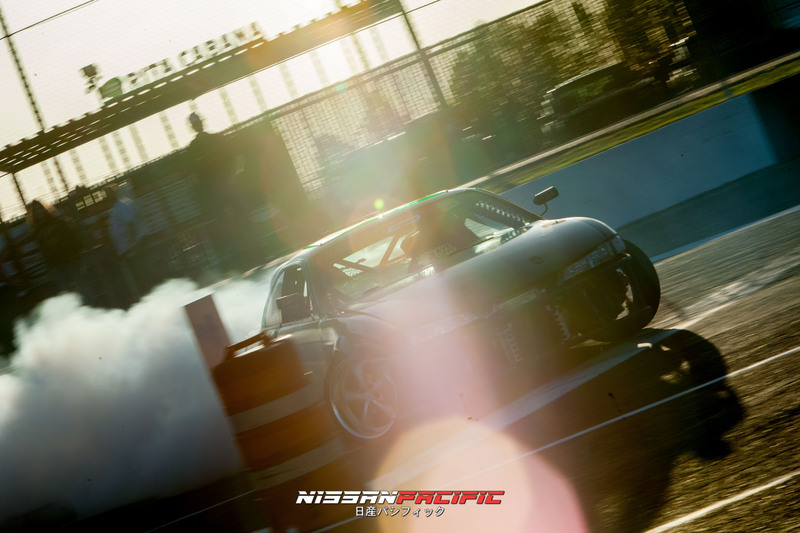 Any money earned will be reinvested into the drifting community as a whole. I am doing this as a hobby and I hope you enjoy the media coverage.